While this operating system 5.0.0.1007 was released as a leak just short of two weeks ago, it has been approved as an official build now by NTT Docomo So, for those with a BlackBerry 9300, enjoy! Remember to delete the vender.xml file if you do not use NTT Docomo as your carrier. Pick up 5.0.0.1007 in the Download Center! So another leak is here. If you are the proud owner of a 9700 then you are in luck. Let us know what you see for changes...I hope you like this build! If you’re still rocking a Curve 8350i, Telus has officially released OS 5.0.0.807. Not sure how many people are still using this Curve, but it’s nice to know you’re still getting upgrades to keep it running better than ever. To find your current software platform and application version numbers, select “Options” and “About” on your BlackBerry. Please be sure to share your feedback here. To download this official upgrade, please select the link below. BlackBerry Simulator Available For Bold & Curve - OS 6! 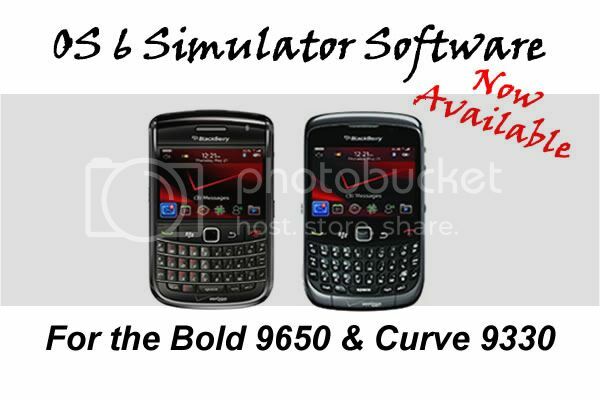 BlackBerry just released OS 6 Simulators for the Bold 9650 and Curve 9330. This is exciting news for Bold and Curve owners hoping that Blackberry releases OS 6 officially for these devices. Given that both simulators are built for OS 6.0.0.317, this may well be the official OS build when and if it is released. BlackBerry® Smartphone Simulators were designed to view and test how BlackBerry® device software, screen, keyboard and trackpad or trackball will work with your application. With a BlackBerry Smartphone Simulator, you can run and debug applications as if they were on an actual BlackBerry smartphone. the original OS 6 installed on these devices. There is currently no information on the BlackBerry site indicating what fixes or improvements this official version includes. Click the link below to download the leak and then let us know what you think of it. A leaked version of OS 6.0.0.407 is now available for the Style 9670. There is no current information however on what changes were made in this revision. We’ll keep you posted when and if the official version gets released.